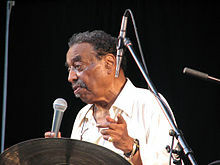 Chico Hamilton (Foreststorn Hamilton, September 20, 1921 – November 25, 2013) was an American jazz drummer and bandleader. Hamilton was born Foreststorn Hamilton in Los Angeles, California on September 20, 1921. His brother was actor Bernie Hamilton. Hamilton died on November 25, 2013 in Manhattan, New York from unknown causes, aged 92. ↑ 1.0 1.1 Keepnews, Peter (26 November 2013). "Chico Hamilton, a California Cool Jazzman, Dies at 92". The New York Times. Retrieved 26 November 2013. ↑ Barton, Chris (26 November 2013). "West Coast jazz great Chico Hamilton dies at 92". Los Angeles Times. Retrieved 26 November 2013.